First Baptist Church Sutherland Springs, Texas, will undertake construction on two new buildings beginning in May. Image by Myrick Gurosky and Associates, provided by the North American Mission Board. SAN ANTONIO — First Baptist Church Sutherland Springs, the Southern Baptist congregation whose members were targeted by a gunman last November in what became one of the worst mass shootings in US history, will begin construction of a new worship center and education building beginning in May. Plans were announced Tues., March 27, by Frank Pomeroy, the church’s pastor. The North American Mission Board (NAMB) will accept donations for the project. If donations do not cover all of the construction expenses, NAMB will cover any outstanding costs. NAMB president Kevin Ezell raised the issue of a new building with Pomeroy in a conversation near the end of 2017. NAMB asked Myrick Gurosky and Associates (MG&A) in Birmingham, Ala., to lead in the development, design and construction of the buildings. 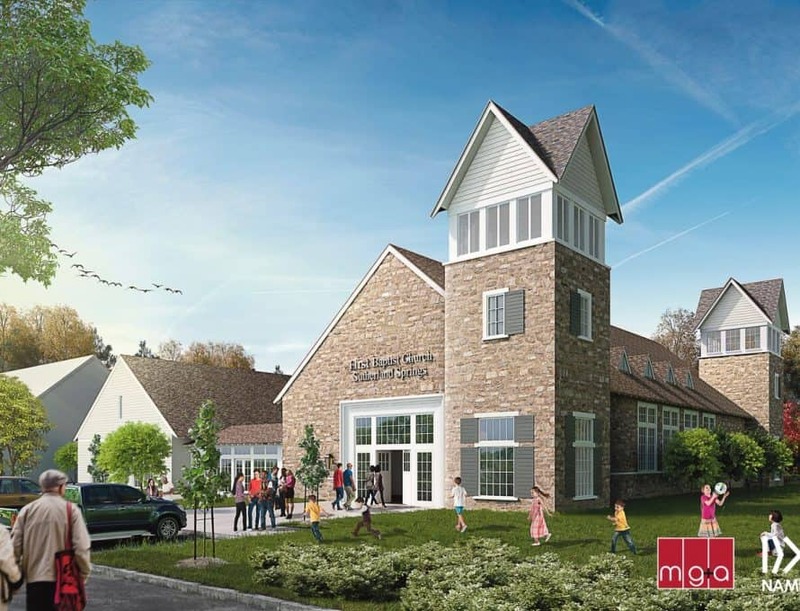 MG&A has worked closely with Pomeroy and leaders of the church in developing designs. MG&A specializes in the management of design and construction and has worked on hundreds of church projects across the US. Groups, organizations and individuals wanting to donate to the project can visit NAMB.net and click “Give.” The link will take them to a special area for giving to the Sutherland Springs building effort. Donations of services and materials can be given through the web site restoresutherlandsprings.com. The planned worship center features an exterior of stone and glass. Two towers on the corners of the building will emanate glowing light. Inside, the worship center will feature seating for 250 people. A memorial to the 26 people who lost their lives in the attack will be located in space between the worship center and the education facility. The education building is designed to host classrooms for attendees age infant through adult. Outside, a lighted, paved parking lot will also be included.